A favourite with SavvyCook clients because it’s an easy to prepare, fragrant and satisfying meal. Chicken is an excellent source of protein and provides useful amounts of B vitamins, particularly B1 and niacin. Carrots are a valuable source of vitamin A in the form of beta-carotene which gives carrots their bright orange colour. Unlike most vegetables, which are more nutritious when eaten raw, carrots have more nutritional value when cooked. Cooking breaks down the tough cell walls, enabling the beta-carotene to be more easily absorbed and converted into vitamin A.
Left-over roast chicken or lamb works really well too in this recipe too: just add along with the tomatoes and carrots at step 4. Which is a shame because vegetables of the Brassica family, particularly when prepared with care, are packed with antioxidants and typically contain a powerful arsenal of cancer-prevention compounds. Cruciferous vegetables contain substances called sulphurophanes, which have been shown to help remove liver toxins and support the immune system. And even if you enjoy eating these vegetables, it can be even tougher to get other people excited about them! 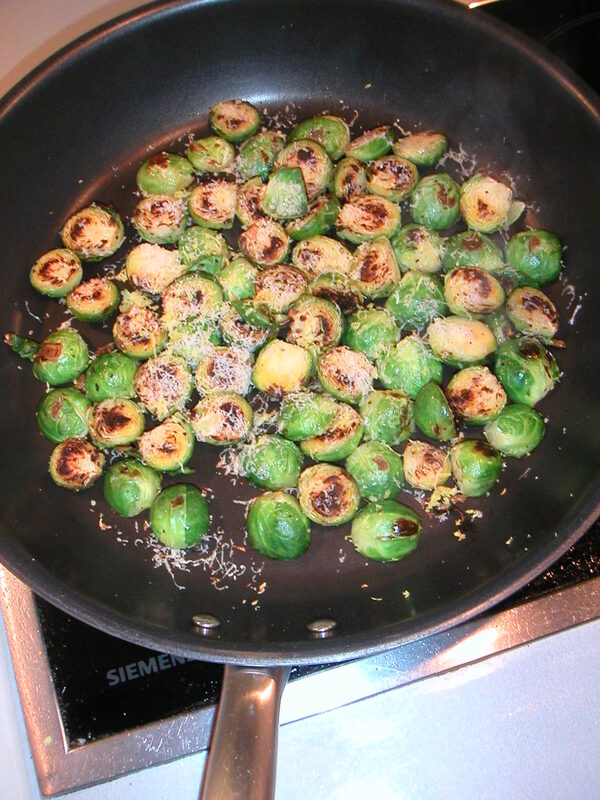 Here is a different, easy and delicious way of preparing nutrient rich Brussels sprouts. Look for sprouts that are on the small side and tightly closed. Instead of Parmesan you can use the very similar light, dry + salty Pecorino or choose a heavier cheese such as a mature Cheddar or Gouda. I think Brussels sprouts done this way are delicious … but let me know what you think. If I can convert one sprout hater into a sprout lover this season I’ll be happy! Partly because they are such an ancient fruit, partly because they are pretty hard to get hold of (they are really only around in November) which makes them a much-anticipated treat. And then their scent is divine: a mixture of honey, musk and roses. When I am able to buy quinces, the first thing I do is fill a large bowl with them and just enjoy their colour and fragrance for a week or so. Quinces do need quite a bit of work: their acidic, hard flesh needs to be cooked long and slowly until the pale flesh takes on a pinky hue. Luckily, because they are so perfumed you don’t need to do anything complicated with them. Poach them like pears, only longer. Just add a splash of water and dollop of honey to peeled, cored and quartered quinces, with a pinch of cinnamon if you like. The flavour of cooked quince is powerful enough to take on rosemary, cinnamon, cloves even star anise, bay and even saffron. 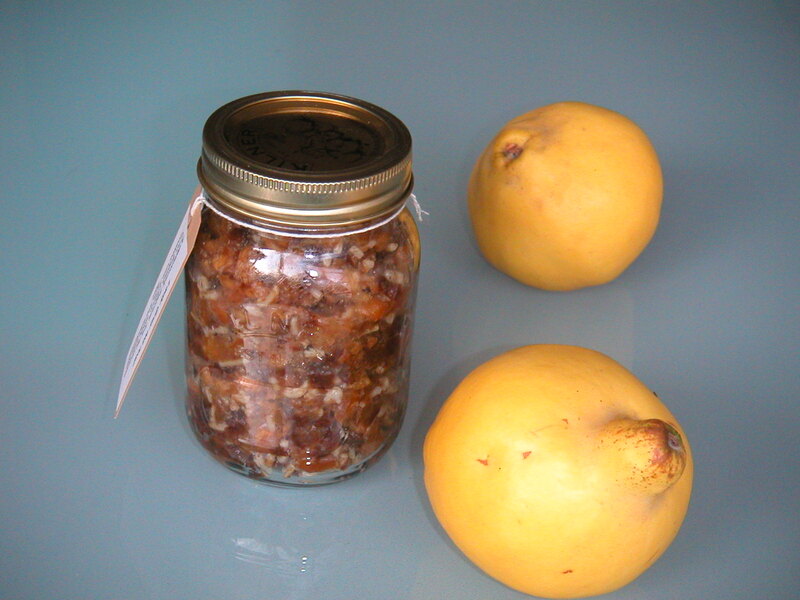 For the recipe below you want a dry-ish compote with some of the quinces poached to a pulp and some still retaining their shape so you can chop the flesh up roughly. 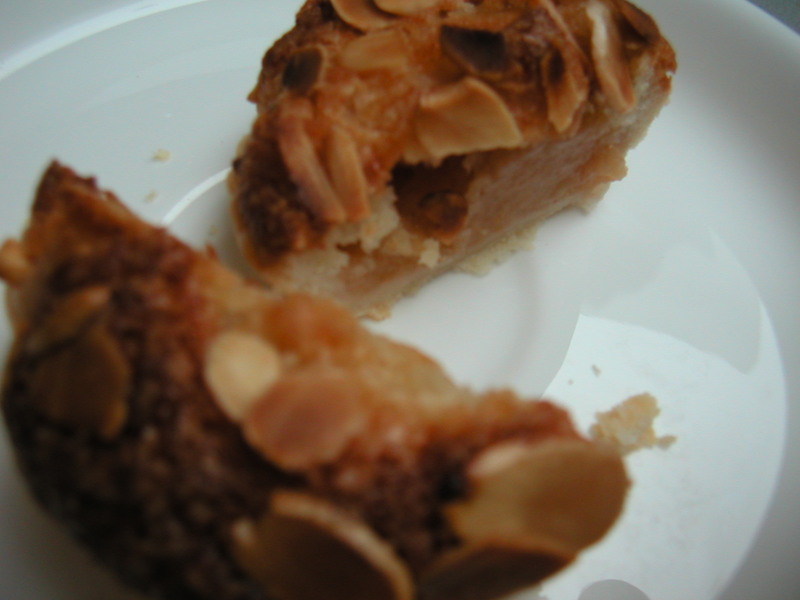 The frangipane quince tartlets I made are inspired by a quince Bakewell tart I spotted in Lawson’s delicatessen www.lawsonsdelicatessen.co.uk in Aldeburgh, Suffolk, a few weeks ago. 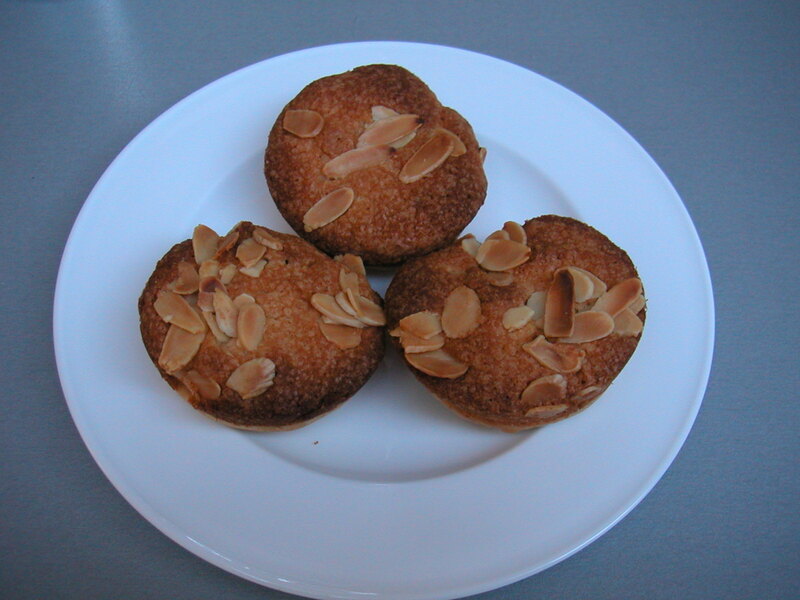 I have since also come across a recipe by Sam & Sam Clarke, chef-owners of Moro www.moro.co.uk , for Tarta de Santiago which reads like a Spanish version of the Bakewell tart made with membrillo (quince paste). These frangipane quince tartlets are a delicious, almondy mouthfuls. Their butteriness balanced by the slightly astringent quince compote. I find the texture very pleasing too: crunchy almonds, soft frangipane and the soft, slightly grainy texture of the quinces. And not too much pastry which can feel like a “sandy mouthful”: the balance between filling, topping and pastry shell is just right. 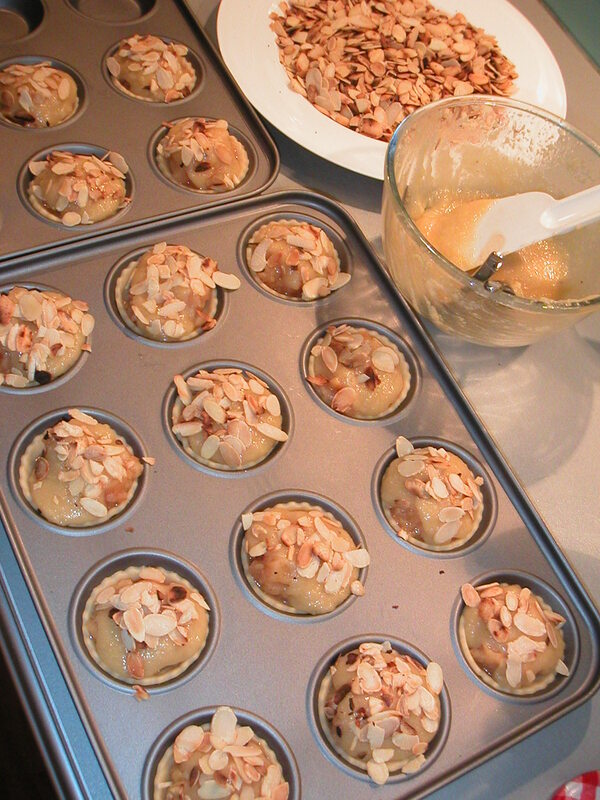 The recipe below makes about 20-24 tartlets. You will 2 x 12-hole, non-stick jam-tart tins. Make your own short crust pastry or take a short-cut. You can buy very decent ready-made pastry. Look out for “all-butter”: Dorset Pastry’s organic short crust pastry is good as is Waitrose’s own label short crust pastry sheets (no rolling out necessary). To make frangipane quince pies for Christmas: simply replace the filling with 1/2 mince meat and 1/2 poached, very finely chopped quinces. 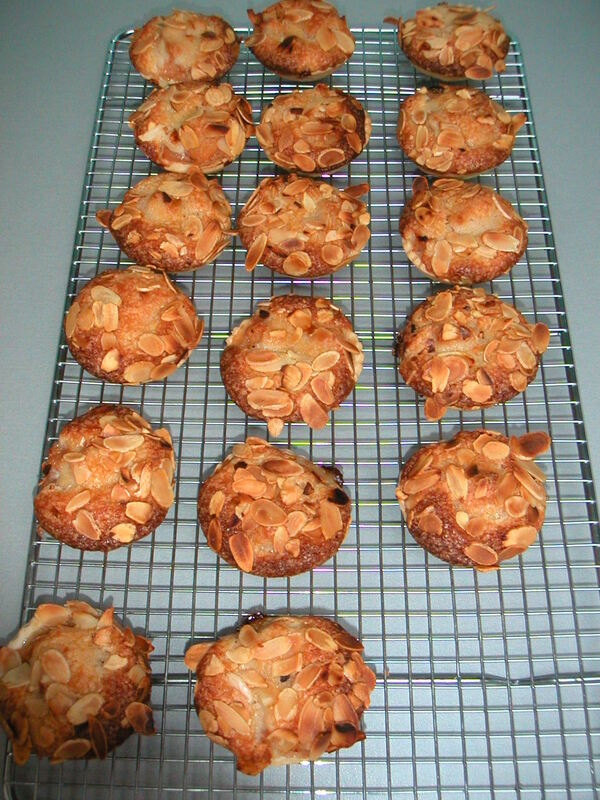 Really delicious, much fruitier and with a more interesting texture I think, they beat traditional mince pies hands down! Enjoy – really good in the afternoon with a strong cup of Oolong tea or glass of chilled sweet wine! This is a fabulous dish: easy to make, satisfying and economical too. A small amount of good quality minced beef goes a long way. And … it’ll make the kitchen smell gorgeous! If you are feeding kids, go easy on the chilli. The alcohol in the wine evaporates during cooking and just gives a lovely deep flavour to the tomato sauce. Serve with pasta, soft polenta or rice and a nice green salad. One of the favourite meals with SavvyCook clients – and rightly so! Lean beef is a great source of easily absorbed iron. Iron is needed to keep the blood healthy and oxygenated and to prevent iron-deficiency anaemia. Beef is also a great source of protein. Tinned tomatoes are an excellent source of an antioxidant called lycopene, cooking the tomatoes means the lycopene is released from the tomato cells and more easily absorbed. Lycopene can help protect against eye disease and cancer. The pasta, rice or polenta provide complex carbohydrates needed for energy. The quantities below serve 2, so the recipe is easy to scale up if you arte feeding more eaters. I’m thinking “yum” as I write. Let me know if you agree.